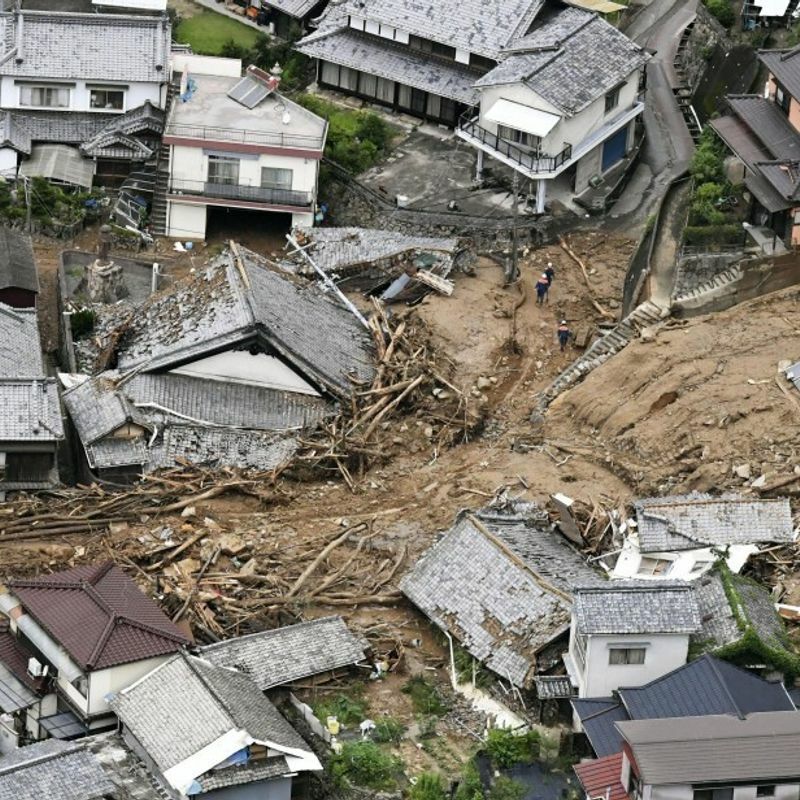 OSAKA - Seventy-two people have died and over 40 remain missing on Sunday after torrential rains triggered massive flooding and landslides in western Japan, with rescue operations continuing in disaster-hit areas. Rescuers expanded their search for those still missing and stranded, with 54,000 personnel from the police, fire departments, the Self-Defense Forces and the Japan Coast Guard now involved. Evacuation orders or advisories were issued for up to 5.9 million people in 19 prefectures at one point, while over 30,000 people were staying at evacuation centers as of 3 p.m. Sunday, according to the Fire and Disaster Management Agency. Many people are also believed to be stranded in their homes due to a lack of access roads because of flooding. 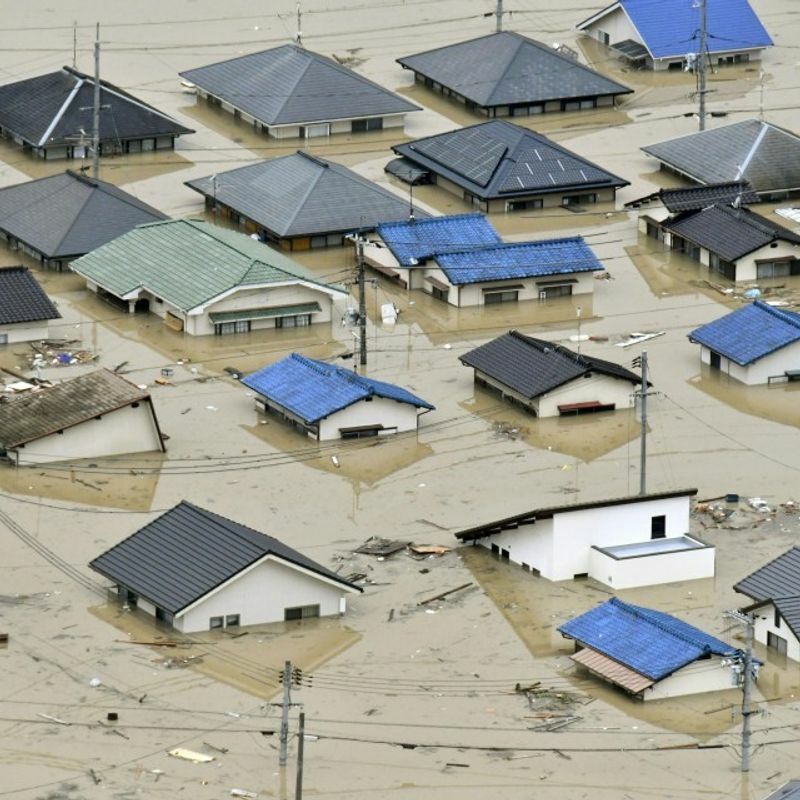 In Okayama Prefecture, one of the hardest-hit areas, about 1,850 people, mostly trapped on the roofs of buildings submerged by floods following the bursting of dikes on a river, were rescued by boats or helicopters. The land ministry plans to mobilize around 20 pumper trucks around the clock to drain the inundated area but it is likely to take about two weeks to complete the drainage. At Mabi Memorial Hospital, about 160 patients and medical staff took shelter on the second floor of the building as the first floor was partly submerged and rescue workers, including SDF personnel, moved them into boats. Since the downpour began Thursday, when the weather agency forecast record amounts of rain through Sunday, 31 people have died in Hiroshima, 19 in Ehime and 10 in Okayama. The 12 other casualties were from Yamaguchi, Kyoto, Gifu, Shiga, Osaka, Hyogo, Kochi and Fukuoka prefectures. At an emergency meeting to deal with the disaster at his office in Tokyo, Prime Minister Shinzo Abe called for all-out search and rescue efforts. It is the first time the government has convened an emergency disaster meeting since 2016 when strong earthquakes hit Kumamoto and Oita prefectures in southwestern Japan. Abe also urged support for relevant local governments in ensuring the provision of necessary supplies and countermeasures against the summer heat at evacuation centers in the flood-hit areas.